Help support Barefoot Productions! 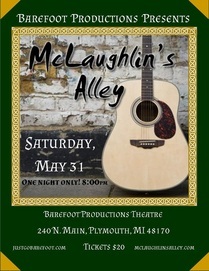 Join us for a fun, Irish-themed evening of music performed by a local favorite, McLaughlin's Alley. You don't have to be Irish to enjoy this upbeat, fun, and accessible music; you'll be singing along in no time, and you may even walk away with an Irish accent! Visit the McLaughlin's Alley website to get to know the band and hear a sampling of their music.